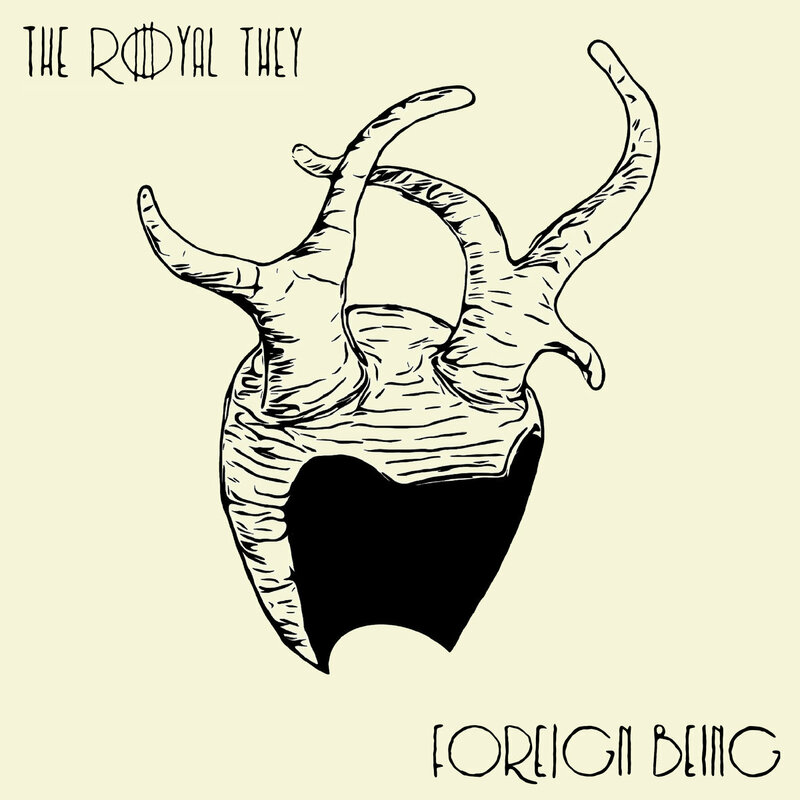 The Royal They are a Brooklyn-based fusion of sludge and pop with an R&B tinge to their shifting songs. On January 13th, they released Foreign Being on King Pizza Records. I decided to take a listen to it. The album cover of Foreign Being is just okay. I sort of like the amateurish art style, but it's just an image of a horned helmet. The linework is too scraggly too. I like the font used, though I wish the "O" in the band's name was the same "O" as in the title of the album. Foreign Being starts with the creepy "C.N.T. ", the description of some gross masculine entity amid screechy guitars through heavy bass. At first I felt like the lyrics were too obvious, but in the end they are very powerful. I like the song. "Sludgefucker" is full of more furious guitars, almost dancey noise-rock riffage. The vocals are pretty awesome and remind me a little of Jello Biafra. "Flying Naked" is much slower and bare, as the title suggests. It sounds like it's about Hellraiser, though, if anything, that's just a starting point. The many shifts in this song keep it going when it almost gets stale. The next song, "Pandemic", took me a few tries to sonically understand. The vocals kept me coming back, a call from a faerie wood under the woodwork of heavy guitar riffage that sounded cheesy at first. "Veritas" is a pop song that sounds like one Iggy Pop might have done in the early 90s. It's very catchy. The second side of Foreign Being starts with "Needler", an R&B-influenced rocker. The guitar solo is sick. "Waiting Game" is a great, punky track about getting what you want from life and not giving up. "Say Less" is another poppy punky one, though I wouldn't exactly call it pop-punk with it's noisy solo and heavier parts. It could have been a Nirvana track. "Leech" speeds ahead, unlike the normal leech. The title relates to the lyrics though. I like the lyrics of "Gullethead" about how we all dream but don't always do what we want to. It's something that I have been deciding just recently, sort of a New Years resolution, to finish things instead of worrying about their completion. The song has a very 90s alt-rock sound. It's my favorite song on the album. The last track "Weekender" continues the poppy punk sound of the second-side. It's kind of cheesy. I like the guitar solos, though I don't like the quiet part that comes right after the first one. The rest is pretty good. I have mixed thoughts on this album overrall. I really liked "Pandemic", "Waiting Game", and, particularly, "Gullethead". The rest were just okay, off by some small amount that was just enough to make it not right for me. The songs have a lot of loops and curves that don't always work, at least on the first listen. I listened to some of the tracks a few times and got a much better understanding of them after the first time. Unfortunately, the production on Foreign Being is not great. It's too clean and too loud; it does not have character. I'm not a fan of the drum sound in particular, and I feel like the guitars get way too loud at times. I get a headache from listening to it. I really want to give The Royal They something more for their efforts, but I don't think I can give Foreign Being any more than a Neutral. The production sets the whole thing into existence, so, along with the few other issues here, that's what does it.